Major Roger Jennings recalling his experiences, begins his story with recollections of the outward voyage from Aden on board the troopship Oxfordshire. As a newly promoted WOII, he enjoyed the privileges of a cabin and waiter service in the second class restaurant. 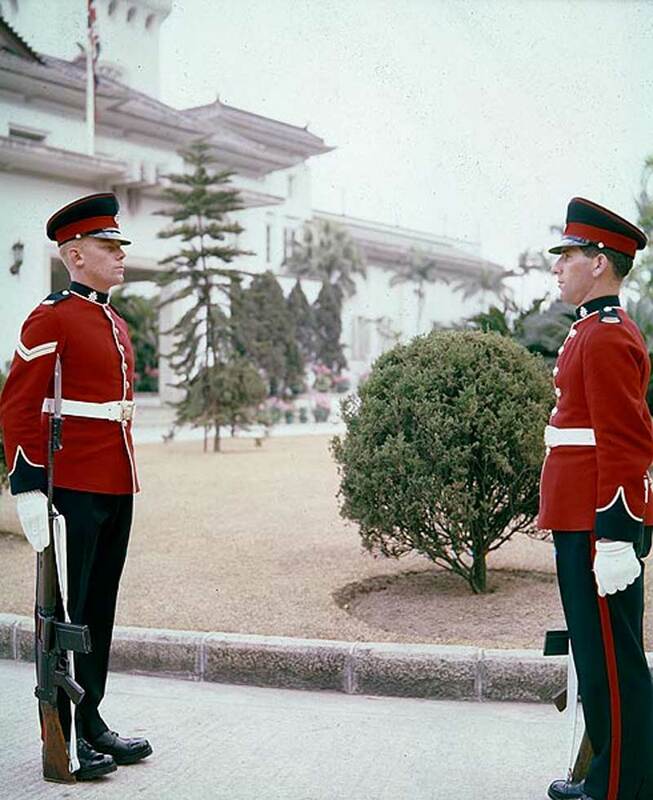 On arrival in Hong Kong in January of 1962, an initial problem arose over the matter of dress. It being winter, battle dress was ordered by the Adjutant but as the temperature was in the 90s with 100% humidity the order was soon varied to "Olive Greens". Perversely the temperature then dropped down to the 50s so a compromise solution of Olive Greens with pullovers was reached. A Training Company commanded by Major John Naumann, with WOII Jennings as CSM, carried out an intensive programme in territory ideally suited for the purpose which included live firing exercises. Care had to be taken not to disturb Chinese graves which were plentiful in the area. Two members of the Chinese increment were attached to the company and proved to be willing soldiers from 0700 to 1300 but thereafter lost interest as they went off to "No.2 jobs". One lost his rifle, which was never found, but there is no mention of the dire punishment which usually accompanied such misdemeanours. Water shortages were a problem, necessitating storage in baths and other containers as and when it was available. A more positive hazard was that of typhoons, a notorious example of which was typhoon Wanda which struck the Sai King Camp in 1962. Nissen huts, when properly lashed down, showed surprising resilience to such elements. Life for Servicemen in Hong Kong was pleasant in those days, eased by the labours of superb dhobi, tailors and char wallahs. For entertainment there were bars, floating restaurants and night clubs to be found in Kowloon or Victoria as well as cheap trips on ferries. It is not surprising therefore that departure for CSM Jennings in November, 1962, for Mons Officer Cadet School, was tinged with regret. Back in England, married quarters at Aldershot did not compare favourably with those left behind in the Far East where spectacular views had been enjoyed from a bungalow at Stanley Fort. It is pleasing that such views, scenes and experiences are so well remembered by former members of our Regiments, and even more pleasing that they are now being recorded for history.